If you’re wanting to add a smoker and grill to your backyard but don’t want two separate units, then you should check out the new Char-Griller Akorn Kamado Kooker, model 16620. This grill provides you with the egg shape that has become so popular at an affordable price that fits any budget. Of course, the name Char-Griller is synonymous with grilling and this new model is no different. This unit provides the capabilities to cook your favorite meats low and slow for a delicious smoke flavor or to grill them up and have the perfect char marks on your favorite steak or burger. With a large cooking space available, you’ll be able to cook for your family or friends for the perfect backyard BBQ. 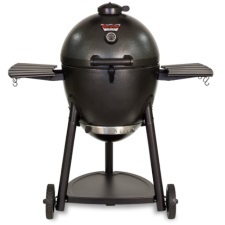 This Smoker Grill earned the “Amazon’s Choice” badge! A very important aspect of cooking your favorite meat low and slow is being able to maintain the correct temperature for a duration. With the Char-Griller Akorn, that is possible due to the well-constructed steel design and adjustable dampers. You can use less charcoal as the unit is built to hold in the heat without letting it out during your cooking process. The grill can hold temperatures that range from 200 degrees up to 700 degrees Fahrenheit. From the warming rack that’s easy to remove to the locking caster wheels, this grill offers an easy to use system that you’re sure to love. You can easily maneuver the grill where you want it to be with the large wheels that lock in place once it’s in the correct position. You can keep items warm while you’re cooking with the spacious warming rack that combines to give you over 400-square-inches of space inside. The ash pan is a simple system that you can remove to dump out your ashes after cooking to keep the grill ready to go for next time. You’ll also enjoy the two large side shelves to keep your sauces and utensils at the ready while you’re grilling or smoking your family’s favorite eats. At the time of this review for the Char-Griller Akorn Kamado Kooker Grill, there are 735 customer comments and reviews on Amazon. This particular model received a 3.8 out of 5 stars among all those ratings. Overall, people who purchased this grill were very pleased with their purchase and were loving the fact that the price was more affordable than other models similar. While most people love the grill, there were some who had issues. Those issues were items such as the packaging not being ideal enough to protect the grill during shipping, dented lids upon arrival, and some said their ash pan broke after just a few uses. Still, others mentioned having air leaks around the grill and not being able to maintain an accurate temperature. While some did struggle with their Char-Griller, there were hundreds of people who loved their purchase. Those who loved their grill said things such as … “Simply the greatest thing you can do in your backyard” … “Love it!” … “Fairly easy to assemble” … “In love with an Akorn” … “Very happy with this grill” … “Delivers amazing food”. In conclusion, this is an affordable option for anyone who loves to smoke and grill that does not want two separate units taking up space in their backyard area. It is affordable so most any budget can utilize this grill to cook up delicious meat and veggies during the summer. Consider adding the Char-Griller Akorn Kamado Kooker Charcoal Grill and Smoker to your outside kitchen today. You can rest assured with the durable design, black sleek style, and the many ways to use this unit that you’re going to enjoy grilling out for your entire family. This affordable Kamado cooker makes it easy to dine on delicious food year-round.